Sir Richard Branson’s new cruise line’s food reveal breaks all the traditional industry rules. NEW YORK, NY — November 8, 2018 — Virgin Voyages, the new lifestyle brand set to disrupt the travel industry, today announces the breadth of its onboard eateries, which include an expansive array of restaurants ranging from haute cuisine to casual fare. With a total of 20+ food choices onboard Virgin Voyages’ first ship, Scarlet Lady, the company released new designs for their restaurants, seaside lounges and casual eateries by their Creative Collective, which includes world-renowned designers from Roman and Williams, Tom Dixon, Concrete Amsterdam and Softroom, amongst others. With beautifully-designed eateries setting the stage, Virgin Voyages has expanded its Creative Collective to include the world class AvroKO Hospitality Group, AvroKO's strategy arm, Brand Bureau (BB), and their very own Michelin-starred chef Brad Farmerie. BB took the reigns creating the strategy for the entire on-board food and beverage experience, viewing it as its own small city and thinking through what experiences the people of that city would want and enjoy. Chef Brad Farmerie of AvroKO Hospitality Group came in to help develop the overall culinary programming strategy and identify culinary experts in the various cuisine types to execute each of the exciting menus. AvroKO Hospitality Group’s portfolio includes Saxon + Parole, Genuine Liquorette, and Ghost Donkey. From experimental and haute cuisine to healthy quick bite options, the onboard eateries are tailored for sailors to realize new experiences that are grounded in core values of discovery, transformation, intimate connections and Vitamin Sea - the brand’s approach to well-being for people and the planet - whilst always being never normal. Situated in a 5,866 square foot restaurant at the aft of the ship, designed by Roman and Williams, Wake offers sailors a dramatic view of the ship’s wake. Serving a theatrical take on steak and seafood, Wake is the most glamorous restaurant on the ship with an experience inspired by The Wolseley - London and The Grill - New York, and a dramatic grand staircase. Offerings include a raw bar (design inspired by the bow of a speedboat), land and sea classics, a table-side cocktail cart and a Sommelier led Magnum program. 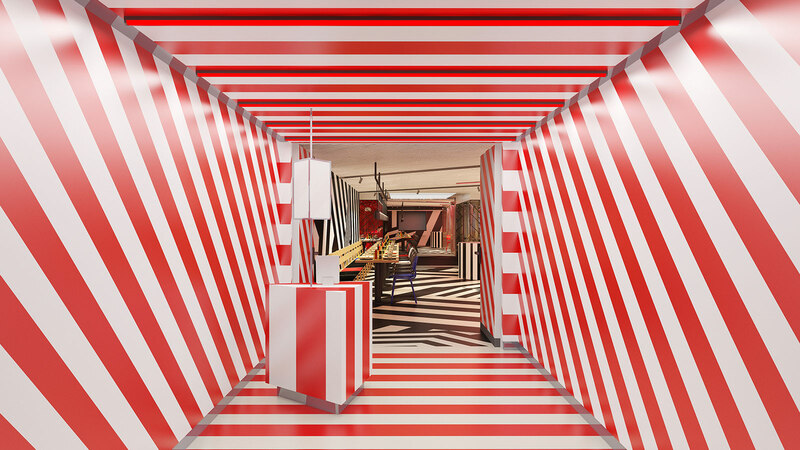 With an interior scheme that nods to the namesake, the bold camouflaging of ships from WWI using patterns of black and white paint, Razzle Dazzle was designed by Concrete Amsterdam. With vibrant and creative twists on vegetarian fare and a juice bar. Razzle Dazzle delivers a healthy dose of nice with just the right amount of wrong. The “nice” menu offers plant-based vegetarian and vegan dishes including must have muchies such as the Impossible Burger. The “naughty” side enables sailors to order meat “add-ons” and offers to spike their healthy smoothies with boozy shots. To live up to the boldness of its name, Razzle Dazzle will not simply brunch but rather Drag Brunch, where sailors are treated to a performance by the Scarlet Lady’s resident drag performer and friends. For a small fee, sailors can opt to enjoy bottomless drag-inspired cocktails like the “Yasss Queen” and the Rizzle Dizzle, a CBD infused cocktail. The Test Kitchen will offer sailors innovative and avant-garde cuisine in a clean and modern space designed by Concrete Amsterdam. Inspired by Escoffier’s Ma Cuisine, this laboratory-like eatery is part cooking school and part restaurant, making it the ultimate place for discovery through cuisine with an atmosphere that is educational, experiential and social all in one. The chef-driven set menus are presented in the form of an ingredient list to Sailors who will discover how the chef combines the list of flavors throughout the course of the meal. This eatery hosts a number of different experiences throughout the voyage from cooking classes, to mixology school to coffee labs, and even a few late-night lock-ins, where sailors will be invited to raid the chef’s fridge and dig into a midnight feast. Geonbae, the equivalent of the expression bottoms up in Korean, is a Korean BBQ restaurant designed by Softroom. Hosted by the loudest servers at sea, each meal will begin with a complimentary round of soju for the table and throughout the evening sailors are encouraged to take part in lively Korean drinking games. A social, hands on, interactive, fun dining experience, Geonbae features specially engineered flameless grills built into each table and invites Sailors to literally play with their food as they cook their perfect BBQ. An elevated Mexican restaurant designed by Tom Dixon, Pink Agave transports sailors to the vibrant streets of Mexico City through immersive void lighting. Offering a wide variety of Mexican specialties that inspire sailors to discover authentic Mexican flavors including tlayudas, memelas, sopes, tortas, esquites, and tamales. Pink Agave’s dishes can be paired with a cocktail from the Scarlet Lady’s expansive collection of mezcals, or signature Agua Fresca cocktails. Pink Agave is designed to be a lively shared plate restaurant experience, where the DJ amps up the energy of the room as the evening hours slip away. Extra Virgin is the ships trattoria serving regionally-inspired and approachable food, deeply rooted in Italian culinary traditions with handmade fresh pasta made daily. A meal begins with shared antipasti followed by approachable pasta-centric favorites. Extra Virgin features a wide and wonderful world of amari and digestivi and traditional Italian aperitifs designed to stimulate the appetite. The wine list will be designed with a unique infographic system to help sailors better understand Italian wines and enable them to navigate to the perfect bottle. The integration of a Coravin at the bar will allow sailors to taste rare Italian wines by the glass. 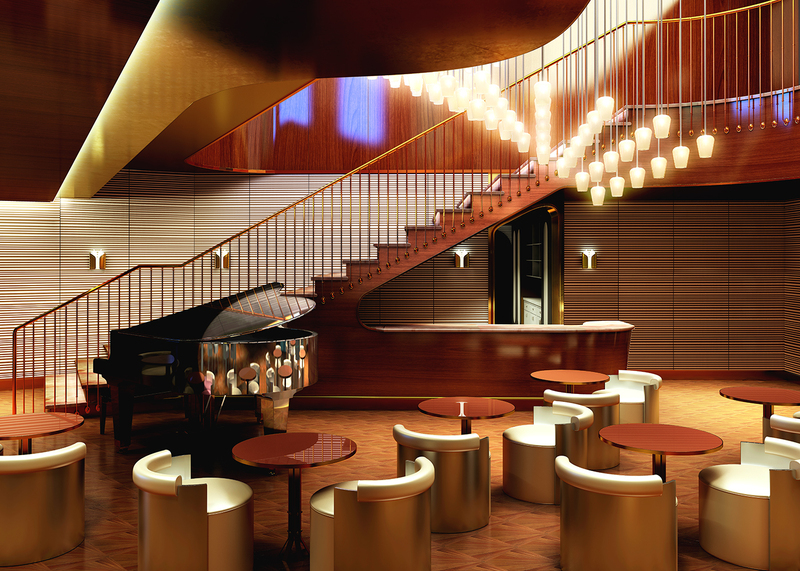 Extra Virgin will offer an Aperitivo hour each day with drink specials and small plates. The dock is a perfect place to hang day and night. 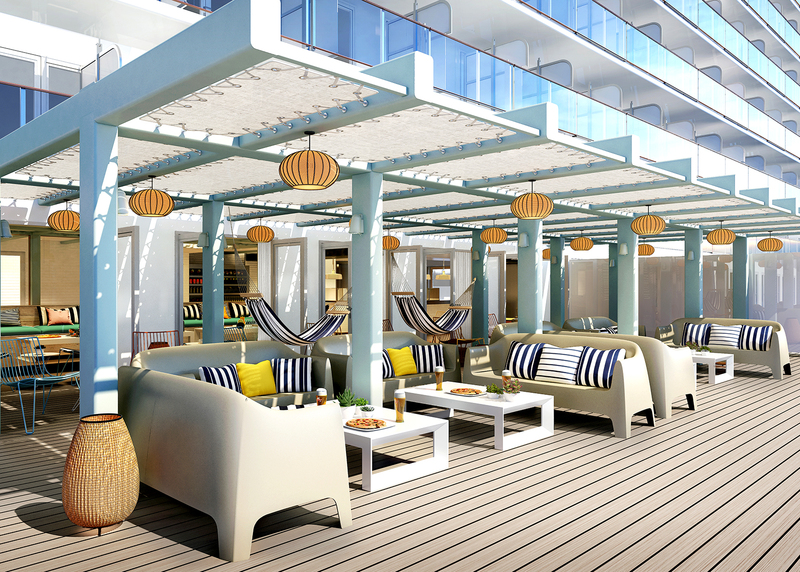 Set in the ship’s sun-dappled lounging area at the aft of the ship on deck 7, The Dock is a beach club-inspired space designed by Roman and Williams. Carts of Mediterranean small plates, salads, dips and mezzes provide perfect graving options throughout the day. Flame grilled to order skewers provide filling hot options for those wanting a substantial bite to eat. Modeled on popular food halls where visitors can taste a cornucopia from different restaurants, The Galley, designed by Softroom, will be the main space for the quick and casual meal throughout the day. The food hall will feature a mix of more than eight shops and food carts, each offering a unique concept with irresistible signature dishes that changes to suit the time of day. The Galley’s concepts include a dedicated bakery and pastry shop, a panini shop, a burger grill, a taco shack, a sushi bar with bento boxes, a noodle bar, a soup and salad stand, and a 24-hour American diner. No pre-cooked pizza slices sitting under warming lamps will be found on Scarlet Lady. The Pizza Place delivers the quick, easy and deliciously satisfying meal. Sailors can choose from the classic menu, or allow them to design their very own bespoke pizza. The Pizza Place features a brilliant beach club-inspired design with white and pastel colored furniture hues and navy striped accent pillows and hammocks for lounging. This casual chill out spot is a great lunch time destination, as well as the perfect late-night, post drink, hunger buster go-to. More details on the new lifestyle brand’s experiences will be revealed throughout the coming year. Those interested in Virgin Voyages can enter to win a tasty free voyage* (open to residents of US and Canada only) now through November 16 by visiting www.virginvoyages.com and opting into the sweepstakes by entering their email address. *Visit www.virginvoyages.com for official sweepstakes terms and conditions. Free voyage for two subject to availability on select Caribbean sailings. Airfare not included with prize. Sweepstakes open only to legal residents of the fifty (50) United States and the District of Columbia, and Canada (excluding Quebec) who have reached the age of majority in the jurisdiction in which they reside at the time of entry. Virgin Voyages is the new lifestyle brand set to disrupt the travel industry. The Virgin Voyages experience is rooted in the modern romance of sailing: a thoroughly modern take on the enchantment and indulgence of the ocean liner heyday when ships were at the forefront of both technology and luxury. Featuring spaces designed by some of the top names in contemporary interiors and livery by Ben Christie and David Azurdia from the multi-award-winning Magpie Studio in London, Virgin Voyages will offer sailors spa services, unique and unexpected entertainment and shore experiences. With its inaugural season scheduled for 2020, Virgin Voyages’ first ship the Scarlet Lady was designed to reflect a yacht’s sleek luxury featuring a silver-grey hull and smoked glass with playful red highlights as a nod to Virgin’s iconic brand. Virgin Voyages is committed to being one of the cleanest fleets at sea with sustainability at the forefront. The inaugural season will host more than 2,770 sailors (18 and over) and 1,160 crew on an unforgettable voyage to the Caribbean.